Many fathers dress up in red suits and white beards around Christmastime and bring joy and laughter to their children. But what happens when the children creep down from their bedroom late at night and catch “Santa” off guard? 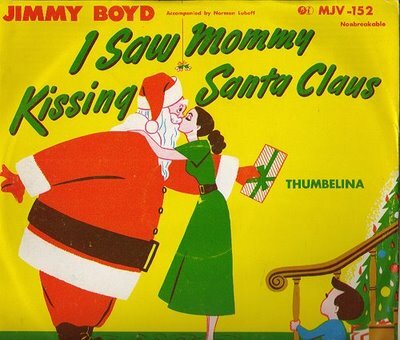 The song “I Saw Mommy Kissing Santa Claus” was written by Tommie Connor in 1952, with 13 year-old Jimmy Boyd singing for the recording. The song reached #1 in the Billboard Charts in December of the same year. Up in my bedroom fast asleep. Mommy kissing Santa Claus last night! keep up the good work !!!! #24: Where Are You Christmas? #17: What Child Is This? #8: Do You Hear What I Hear? #3: Mary, Did You Know?